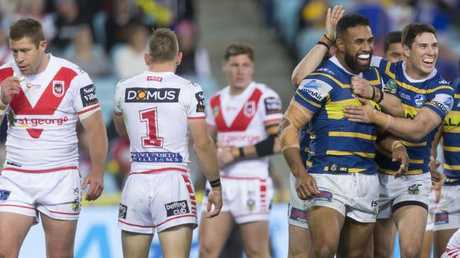 THE GREAT St George Illawarra slide is well and truly on again after the one-time premiership favourites were embarrassed 40-4 by the last placed Parramatta Eels. 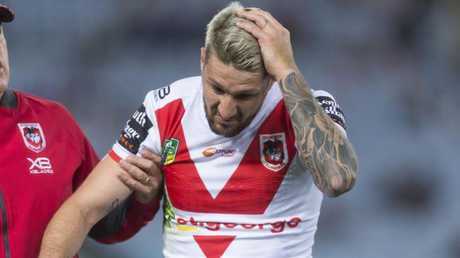 The result capped a horrid night for the Dragons who not only fell out of the top four for the first time this season but may have to play on without Gareth Widdop for the rest of the season after the skipper dislocated his shoulder in the first half in front of 10,541 at ANZ Stadium. 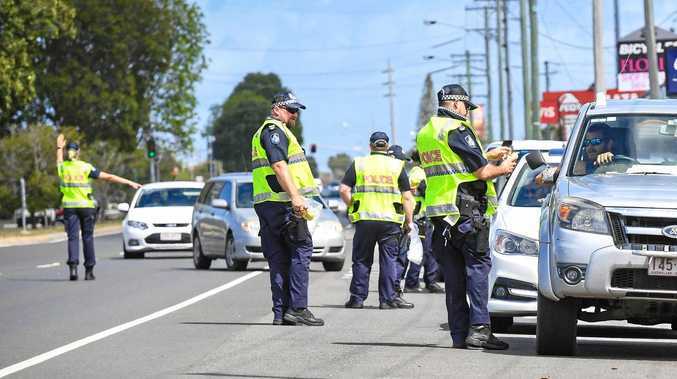 "I got it back in, so we'll wait till tomorrow and see what comes of it,'' Widdop said. The Dragons will also be without Paul Vaughan (ankle) for at least a month while winger Jason Nightingale (neck) is also unlikely to be fit to play the Tigers on Saturday. St George Illawarra have now slumped to five losses from their past six games in what was their biggest loss of the season prompting coach Paul McGregor to declare his side let in "soft" tries. "That score line is very ugly," McGregor said. "We have a few players who are down on confidence which can happen. We have to make sure we manage that. Widdop left early with a shoulder injury. AAP Image/Craig Golding. "I'm the leader of the group I'm the most disappointed. We can still make the four." The Eels rushed to a 22-0 half-time lead with Jarryd Hayne scoring a first half treble - his first since round one 2013. But the real star for the Eels was halfback Mitchell Moses. Moses scored a 40 metre solo try and laid on another four tries to produce his best performance of the season. It has been a remarkable turnaround for a Parramatta side who have won three of their past four games to build some momentum in the back end of the season. The victory also takes the Eels off the bottom of the premiership ladder for the first time since round two. It was Parramatta’s best performance of the season. AAP Image/Craig Golding. Eels coach Brad Arthur said it was his team's best effort of the year. "First time all year we've been put in a full 80 minutes," Arthur said. "We've had our fair share of distractions. We're going through a review process. To the boys credit they have continued to come and bounce into training. There have been no shorts cuts in preparations in the performance. That's the team we want to be. "The boys are giving us something to build on for next year." 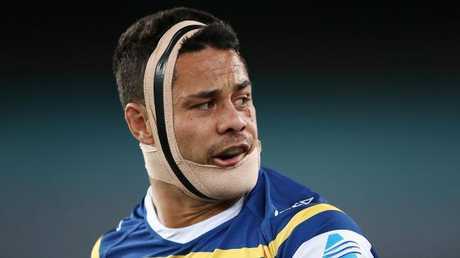 Hayne was sporting an odd look but still managed three tries. Photo by Mark Metcalfe/Getty Images. 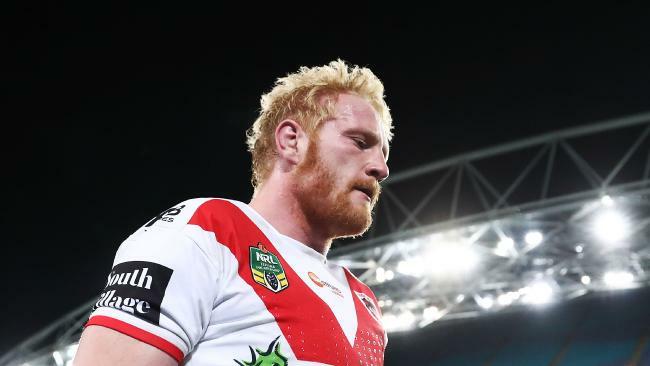 The Dragons not only leaked plenty of points, they conceded the opening seven penalties with the final infringement resulting in Cameron McInnes' sin-binning. Hayne scored twice inside the opening 12 minutes to give the Eels a 10-0 lead. The Eels scored once with McInnes sidelined when George Jennings easily sliced through Jack de Belin and Luciano Leilua from the scrum to score. Hayne had his third just before half-time to sink the Dragons. St George Illawarra scored first in the second half via Leilua after three minutes but any hopes of a second half comeback ended when Clint Gutherson crossed just four minutes later. Siosaia Vave closed out the scorning in the final minutes.